Reflecting Western Canada's renowned ranching heritage, ACANA Ranchlands meets your dog's evolutionary need for rich fresh and diverse protein sources with three premium red meats: Alberta Beef, Alberta Bison and Alberta Lamb all raised free-range on local ranches and then delivered FRESH so they're preservative free and loaded with goodness to nourish your dog completely. 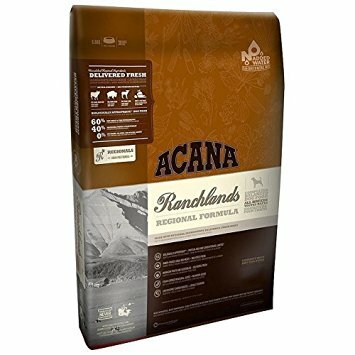 Satisfies your dog's biological requirement for abundant meat proteins. Infused with marine source of omega-3 (DHA EPA) to promote luxurious skin and coat conditioning. High levels of glucosamine and chondroitin are naturally present in ACANA diets. Raised free-range on on local ranches the Alberta beef and lamb is grass-fed certified as antibiotic-free passed fit for human consumption and then delivered FRESH each day. Raised free-range on Alberta's foothill farms the Bison is grass-fed certified as antibiotic-free passed fit for human consumption and delivered FRESH each day. Deboned beef; beef meal; green peas; deboned lamb; lamb meal; whiteﬁsh meal*; herring oil; ﬁeld beans; red lentils; salmon meal; deboned bison; beef liver; lamb liver; sun-cured alfalfa; pea ﬁbre; whole apples; whole pears; yams; whole pumpkin; butternut squash; parsnips; carrots; spinach greens; cranberries; blueberries; kelp; chicory root; juniper berries; angelica root; marigold ﬂowers; sweet fennel; peppermint leaf; lavender; rosemary.